BELIZE CITY, Wed. Jan. 27, 2016–The oil exploration contract for US Capital Energy expired on January 21, 2016, but Amandala is reliably informed that the company has asked the Government of Belize whether it can renew its petroleum concession—at least for another year. When we asked Alistair King, US Capital Energy’s representative in Belize, about the possibility of the company pursuing an extension to its contract, he told us that although they had asked the Government to consider it, no decision has yet been taken. King said that their directors are still considering it, and they are negotiating. He added, though, that crude prices are expected to hit a low of US$17 a barrel – which would be a factor that will be taken into account when the company determines how it will proceed. If US Capital gets an extension to its contract, it will likely pursue drilling 15 feet away from the well it abandoned last year, after the rotten egg smell of hydrogen sulfide fumes emanating from the well forced them to cap it. 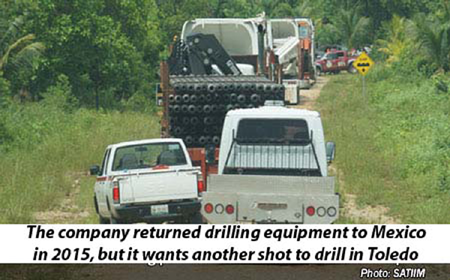 The company has said that it has invested US$40 million to explore for oil in Belize. The contract—which, was first issued to US Capital 15 years ago, on January 22, 2001—has already been amended twice: back in 2004 and again in 2007. The second contract period of 8 years began in January 2008 but expired about a week ago with no commercial discovery to date.